Obviously, I’d be perfectly happy if the only pets I ever had were dogs. Dogs, dogs, and some more dogs. But I just love animals in general, and so a large part of my daydreaming involves thinking about all the animals I’d like to have in my life one day–including my small pack of dogs. Our Spencer actually looked just like this guy, same markings and everything. Click for source. I adore rabbits. I think this is because our first family pet was a rabbit: Spencer, the mini Holland lop, who was the Greatest Bunny Who Ever Lived. Spencer was the gentlest and sweetest bunny. Miraculously, despite being somewhat roughly handled by the four of us as children, he never bit us, not even once. We liked to think he played “hide and seek” with us in the backyard; he enjoyed chasing us around the yard and hiding with us underneath bushes and small trees. I would get rabbits in a heartbeat–although I think they’re probably the most tempting (and defenseless) small animal to bring home if you have a dog like a German shepherd. Rabbits, unlike cats, have no defense mechanisms and I don’t know if I could ever trust a dog with a rabbit, but that somehow hasn’t dampened my desire for a bunny of my own. Maybe one day. Backyard chickens are the new thing for suburban dwellers, it seems–at least in our area of Virginia. Everyone (ourselves included!) wants to think of themselves as quasi-farmers. We have lots of friends who have a small coop of egg-laying hens in their yards and I confess that the idea has become very attractive to me lately. I don’t know if we’ll have enough room at our new house–and I think chickens would also be a constant, maddening distraction to a high prey-drive dog–but it’s a nice daydream. They’re certainly not as loveable or companionable as a bunny, but I like them just the same. They’re also not as stupid as people tend to think. I've always been partial to Arabian horses, even though they are the most high-strung. Click for source. Like many little girls, my horse obsession began at a very young age. I think I actually became fixated with horses before my dog obsession began. I read all the horse books I could get my hands on. I memorized horse breeds. I begged my mother for riding lessons. The equestrian life is, however, a very expensive one, and my parents couldn’t afford to send me (and my copycat little sisters) to riding lessons. They did, however, send us to a horse camp where we mucked stalls and groomed horses in exchange for a few lessons in the summers. I loved every minute of it, even mucking stalls. The sweet smell of hay and the presence of these glorious, sensitive animals filled my little heart with joy. While I haven’t had much interaction with horses in a long time (*excepting one of the best parts of our honeymoon: Guion knew about my lifelong adoration of horses and surprised me with a two-hour trail ride in the Blue Ridge mountains), I do dream about them still. They’re a serious, serious commitment, but they’re also a nice thought. Baby goats, you are breakin' my heart with your cuteness. Click for source. Goats are such ornery, funny creatures. I like them a lot, even though they may be somewhat hard to love (excepting those babies). I also love chevre and goat milk soaps and such, so I daydream about having a small dairy flock of my own one day. Zebra finches. Click for source. Snuggling budgerigars. Click for source. I like birds a lot, even though they are a pain to take care of/sometimes saddening to think about living your whole life in a cage where you can’t fly. So, maybe I won’t get a bird. But I grew up with a Zebra finch named Sprite and a pair of budgies that I received for my thirteenth birthday, whom I christened Monet and Renoir (they were in love). They are messy and noisy, but oh-so-beautiful to look at. Maybe not reason enough to adopt some, but I love them just the same. A handsome family of kittens. Source: Itty Bitty Kitty Committee. I am very ambivalent about cats, but I like them most of the time. I don’t think I would like to take care of one or actually be responsible for one, but I have my moments of soaring adoration and affection for cats. It’s perhaps not surprising that my favorite cats are the ones who act like dogs. The only cat I’ve ever truly loved was my roommate in Denver, a tabby lady I called Kitteh. She was inquisitive and affectionate without being obnoxious. Kitteh was charming and intelligent and I loved sharing a bed with her. I would get a cat if I could get one with a temperament just like hers, but I’m doubtful about how likely that is. I think cats are supremely beautiful. I think they make every room look more elegant. But I wonder how quickly I’d resent a cat if I actually dared to bring one home. Who knows? Maybe one day there will be room for a cat. Do you have other animals, besides your dog? How do they interact, if at all? Let it be known that I hold strong leash biases. I LOVE a soft, non-nylon leash, especially a rope leash or a leather leash. I DETEST retractable leashes in almost all walk circumstances. And I hate a nylon burn on my hand, which has happened many times at the SPCA. Mendota leash, $12.19 at DogSupplies.com. This is the leash I’m pretty sure I want. After having used a Mendota leash with Dublin before, I was sold. After a few uses, it becomes very soft, and the braided rope is very strong. The leash is also quite affordable. I think it could probably qualify as a rope leash, too? They’re also sold in a slip-collar version, which is also appealing. Zoey's reflective leash, $7 at DogSupplies.com. I bought this leash in orange already, because sometimes I like to go running with Bo at night. I feel like both of us are so much safer with this leash, since we tend to run around a lot of busy streets when it gets dark. I do wish the tape was on both sides of the leash, but for $7, I really can’t complain! Latigo leather twist leash, $18.29 at DogSupplies.com. A nice, classic burgundy leather leash, which is also 6 feet long. It seems like a nice 6-foot leather lead is somewhat hard to find. And you can’t beat that price. 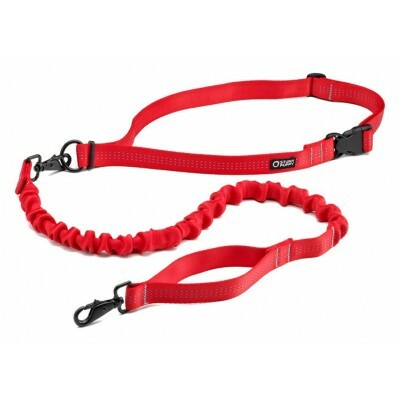 Hands-free runner dog leash, $35 at Olive Green Dog. Look, ma! No hands! This could be a great option for those who like to run with their dogs. Do you have a particular leash that you’re loyal to? Any that you’d recommend? Lab in a built-in dog bed. Click for source. My serious type-A self has, of course, already made a detailed shopping list and budget for our future dog. Here’s my preliminary list. What do think? What’s missing? Clean-up bag dispenser for leash. High-quality, grain-free kibble/whatever the dog was eating previously to ease the transition. Stainless steel bowls in a raised feeder. Car harness or other form of restraint. Standard Kong, or assorted chew toys. Now, to figure out how to budget for this! Tory Burch dog collar. Yeah, right. The SPCA introduced me to one of the greatest pieces of dog gear: The martingale collar. Almost all of the dogs at the SPCA are fitted with a Premier martingale collar when they arrive. These collars, which tighten without choking, have saved me from losing an unruly and bucking pup many times. They are most useful for hounds, or for breeds with long necks who are easily able to slip out of standard collars, but I’m a huge fan of them and plan on getting one for my future dog, regardless of his or her breed or breed mix. Victorian Bronze martingale collar from 2Hounds Design, $36. 2Hounds has so many gorgeous, embroidered martingale collars. I know they’re typically just used for greyhounds, but I’d put one of these beauties on any dog. Classic Hound martingale collars, $32. Geo Flax martingale collars from Classic Hound, $32 for the large. I like the fabric on this collar a lot; it’s retro/trendy without being garish. Classic Hound martingale collar, $34. Desert Winds Blue martingale collar from Classic Hound, $34 for the large. Also really pretty. Apparently, I’m very partial to Eastern-inspired embroidery. These are probably only appropriate for lady dogs, though? 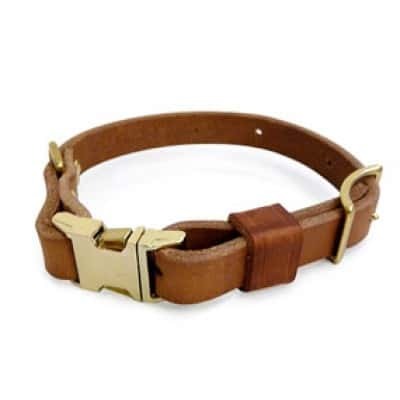 Stunt Puppy collar at Olive Green Dog, $22. Stunt Puppy Biothane waterproof collar, $22 at Olive Green Dog. The promise of a stink-free collar is pretty tempting. It’s also apparently “one size fits most,” which is kind of amazing–but I think it is primarily for medium to large dogs. Tuff Stuff collar from Olive Green Dog, $22. Tuff Stuff 2″ leather collar in burgundy from Olive Green Dog, for $22. Now THAT’S a manly collar. Bold Designs collar, $39 at Olive Green Dog. Another manly collar. I like the brass/gold detail. It looks very sturdy. Martha Stewart houndstooth collar, $12. Martha Stewart Pets Houndstooth collar, $12 for the large at PetsMart. Very classic. FOUND collection waxed canvas collar, $48. FOUND collection, blackwatch plaid waxed canvas collar, $48 at Olive Green Dog. I just love everything the FOUND collection does. Especially that absurdly expensive rope leash. This collar is also absurdly expensive. I don’t buy clothes for myself that cost that much. Do you have a favorite collar you’d recommend? The pet product industry has expanded to such an extent that I’m regularly astounded at the types of things that are available for pets when I walk through a store. It’s mind-boggling and sometimes embarrassing to see the useless stuff people will buy for their dogs. But, of course, I love looking and preemptively deciding what I want to get for our future dog (6 months and counting!). Lately, I’m thinking about dog beds. What will our dog prefer? What would look good in our own bedroom? Will our dog even want to sleep on his or her own bed? (Probably not. Clearly, our bed will be prime real estate.) We bought a lovely sherpa-lined bed for my childhood dog, Emma, but I don’t think she ever slept on it. She got in bed with my younger sisters instead, or sneakily climbed up on the couch (where she wasn’t allowed). Every dog I know loves to rest her head on the couch arms. This bed attempts to simulate that experience. A pleasant color, too. K&H Pet Products Bolster Couch, from PetsMart, from $60 to $80. Um, can I get one of these for myself? Drs. Foster & Smith has a lot of high-quality dog beds in their catalog. This is the Luxury Chaise Lounge dog bed, and it prices from $100 to $170. So classy! With the large size at $279 at Olive Green Dog, they ought to at least be classy. A classic pattern for a classic pooch. Martha Stewart Pet’s Houndstooth Dog Bed, $44 at PetsMart. Does your dog have his or her own bed? Any particular type or brand you’d recommend? From all of my reading about German shepherds, a warning that is always repeated is that they are SERIOUS shedders. There is little that can be done to prevent this, but the degree of shedding can certainly be lessened with a healthy diet and regular grooming. I love grooming dogs. This might be weird, but I think it’s a hold-over from my girlhood. I never grew out of the brushing My Little Pony’s tail-phase, apparently. 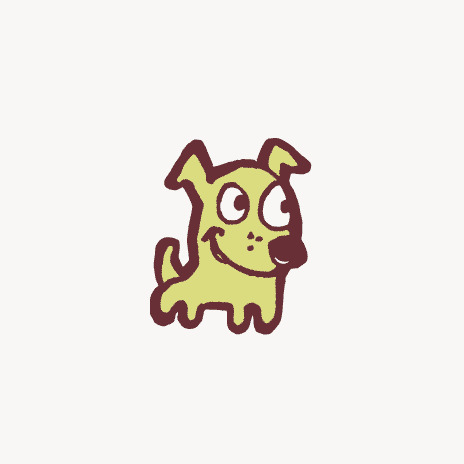 At one point in middle school, I had even decided that my life calling was to be a dog groomer. While I’m glad I didn’t end up doing that, some days, it still really appeals to me. The one magic tool I have heard of and used is the FURminator. It’s expensive, yes (ranging from $40 to $75, depending on where you shop. FURminators at a discount can be found at PetEdge), but it really, really helps strip off the dead coat–better than most tools. If you haven’t used one before, you will literally be astounded at how much hair comes off. After just a few minutes of using the FURminator, I think you could very easily stuff 10 full-sized pillows with all of the excess hair. Dogs seem to love it, too! I’ve only used it a few times on different dogs, but they all seem to enjoy the process, even more than standard brushing. It is expensive, but I think it’s worth it. This is one brush that I’ll definitely be investing in once we bring our future dog home. Do you use the FURminator? Do you have any other magic grooming tools you’d recommend? My enchantment with rope leashes has been well documented here. Thankfully, there is an affordable alternative with the braided Mendota leashes. Even though it’s not rope, Mendota makes leashes that are the (much!) cheaper version of that gorgeous Found rope leash. After you walk a dog on one of these leashes, you’ll never want to go back to flat nylon! With a few uses, the leash becomes very soft and pliable–but still strong. DogSupplies.com sells a wide variety of styles and colors of Mendota leashes. These leashes are definitely on my wish list for our future dog. What’s your favorite type of leash?